Working In The Music Industry was written specifically for those who are seeking career opportunities in the commercial music business. 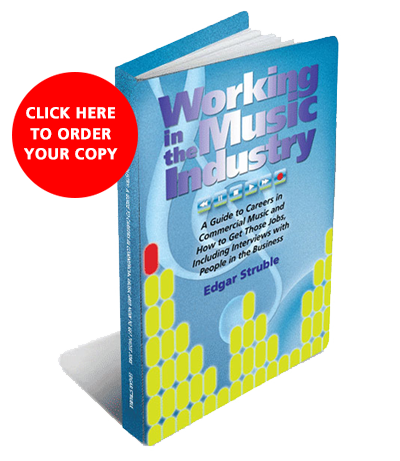 With over 30 successful years invested in the entertainment industry, Edgar Struble has authored a practical guide to the many jobs in the business. Written from personal expertise, the book covers most of the major job titles and also contains interviews with many who walk in those shoes daily. This is a must-read for anyone who wants to take a closer look at working in the rewarding and exciting commercial music industry. Working in the Music Industry, an invaluable collection of straightforward advice on preparing for and entering careers in the music business. Edgar draws upon his extensive experience as a performer, music director, and producer in presenting the myriad opportunities available in the field, from road musician to concert promoter to entertainment attorney and everything in between.